The month of August is coming to an end. The last Monday of this busy month brings with it a special revelation: which blog was I assigned to cook from as a member of The Secret Recipe Club? And who is posting something from my blog? Which recipe was chosen? So much excitement, so much fun… This month I was paired with a food blog Queen: Amy, the hostess of “Fearless Homemaker” has even been on TV! You can read about her first cooking demonstration by clicking here. And now, here I am, cooking a recipe from her blog. Too cool for words. If her blog is new to you, I strongly recommend you to stop by. Not only she has loads of wonderful recipes, but side-stories that are truly special, like her surprise wedding party. She and her partner invited friends over for a nice get-together, and all of a sudden both disappeared, changed into their wedding outfits, and next thing their guests knew, an orchestra was playing, a priest was arriving , and the party turned into their wedding! Now the family got bigger, as she and her husband recently welcomed the arrival of “The Fearless Baby“… Congratulations, Amy! Heat the oven to 350 degrees F. Spray an 8 by 4 loaf pan with cooking spray and set aside. In a medium bowl, whisk together flour, baking soda, salt, cinnamon, allspice, and cloves. Reserve. In the bowl of a stand mixer fitted with the paddle attachment, add the eggs and beat on medium speed for about 30 seconds. Add in oil, applesauce, vanilla, mix until smooth. Add the sugar and mix until well combined. Slowly add in the flour mixture, incorporating until the flour is barely combined. Gently fold in the apple chunks. pour batter into prepared loaf pan. Prepare the topping: in a small bowl, mix together brown sugar, sugar, and cinnamon. Sprinkle this topping over the batter in the loaf pan. Bake for 50-55 minutes, or until loaf is golden, and a toothpick inserted into the center comes out clean. Cool bread in pan for 10 minutes. loosen sides of the loaf with a knife and invert carefully. Cool the cake completely on a rack before slicing. Amy, it’s been great to spend time on your blog, reading your stories, marveling at your photos. I hope you enjoyed this month’s assignment as much as I did! The detail of leaving the apples in chunks makes this bread – a beautiful marriage indeed! I like Amy’s blog too, and I think this cinnamon bread looks awesome! Her blog is great, I was lucky to get it this month! Did you say cinnamon sugar on top? I’m in. Great SRC pick! What a perfect recipe for the upcoming fall season. I can’t wait to smell it baking in my own kitchen. Thanks for sharing! Thanks for stopping by! Hope you are having fun in this special Monday! Oh my that looks amazing – I can smell it through the computer! 😀 Great SRC choice!! 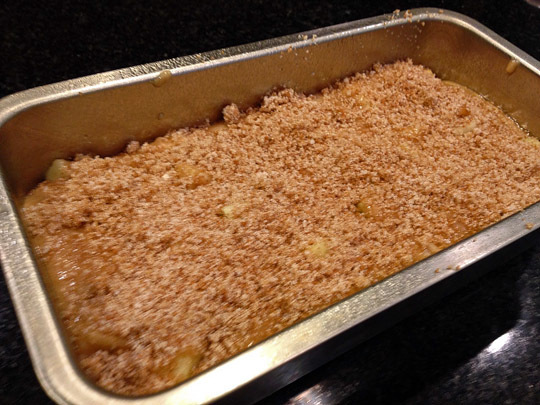 I am glad I settled on that recipe, it was a tough choice, but apples, cinnamon, well… you know… a winner! Apples and cinnamon are a match made in heaven. Happy Reveal Day for you too! Hope you enjoyed the round up! What a great intro you wrote about Amy’s blog! And this bread! I’m all over it. I LOOOVE anything with apples & cinnamon! This bread looks great– can’t wait til I have crisp Fall apples to bake with! Apples and cinnamon, cannot beat that combo! This screams fall and I cannot wait! great pick! Emily, it’s a good thing lots of people love the Fall, I actually like cooking in a cooler weather, but the idea of Fall brings the fear of Winter. Not good. This looks like a perfect autumn recipe! A great way to welcome fall. I am going to miss apple season in the northeast this year. Always one of my favorite times of year there. This is a perfect recipe after a morning picking apples! Oh you should it is so fun! You know, when I made it I did not even think about the fall, but you are absolutely right, this screams for that season… I can only hope it won’t come too soon…. I am such a summer lover! Yummy! This sounds perfect for fall! I’ll have to mark it to make later. I just love any baked good with apples! This looks yummy! Great SRC pick! With fall right around the corner, this is perfect. I walked to lunch today and saw apple trees heavy with fruit – now I want to make this! Great SRC pick!! I love apple anything! Bread, scones, pancakes… This looks amazing and something I will definitely have to try! Thanks for posting it. Love cinnamon everything and this looks like the perfect breakfast! This sounds awesome and perfect for fall! I pinned it for later 🙂 Great pick this month! 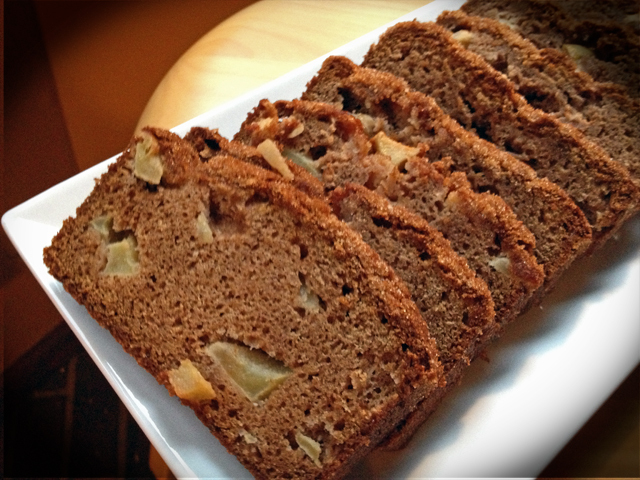 Apple bread is one of my fall-time favorites. This looks fantastic! This was my first time making this type of recipe – I’ve made apple pies, apple cakes, but never included in a loaf. The sound of this bread is definitely getting me excited for fall! So many of my favorite flavors and spices. One of the reasons I look forward to autumn is recipes like this one. Delicious! I’m ready to be done with the heat and humidity. It’s hard to do full on cooking when it’s like that and I’m ready to create more dishes! at least here it’s not very humid, so that helps…. heat and humidity can be tough! I can smell this lovely loaf baking from here… all the fragrances of fall swirling about in my mind and heart. Delightful. Love the bits of apple coming through and wish I was working in your department to enjoy it with you along with a warm cuppa ;-). Apples and cinnamon is my favorite combo of all time. Now I want a piece of this bread! Maybe there’s still enough time in the day for me to get a loaf in the oven. Thank you for sharing Sally and thank you for all your kind words on my blog! I love eating apples and baking with them – this looks like a great recipe. Totally agree about the amazing smell in your kitchen when you bake with cinnamon. Great SRC pick.